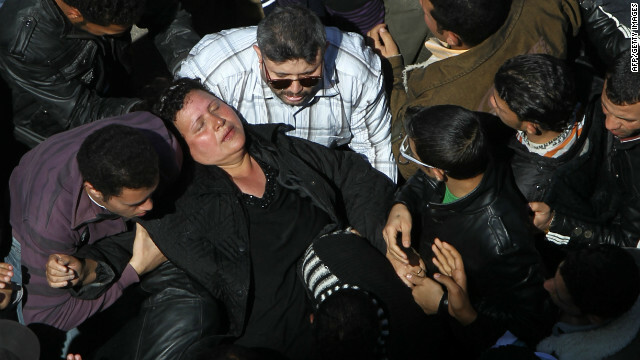 A woman faints as crowds converge on Saint Mark's Coptic Cathedral in Cairo's al-Abbassiya district, March 18, 2012. Cairo (CNN) -- Overcrowding inside a cathedral where Coptic Christians had gathered to pay last respects to their pope caused a stampede that left three people dead and more than 50 injured, a health official said. Coptic Pope Shenouda III, who led the Coptic community for more than four decades, died Saturday. He was 88. On Sunday, thousands of Christians paid their respects to him at the Coptic cathedral in Cairo where his body went on display in an elaborate golden crown and red and golden robes. The mass of people inside the cathedral prompted the stampede, according to Deputy Health Minister Hisham Sheeha, who said three were killed and 52 injured, most suffering from lack of oxygen and low blood pressure. Shenouda's funeral will be held early this week and is expected to bring millions of Christians onto the streets of Egypt at a time when tensions with the Muslim majority are high. Egypt's Christian minority has been the target of a number of high-profile attacks in the past several years. The bombing of a major church in Alexandria in January 2011 left at least 21 people dead, and at least 25 Coptic Christians and their supporters were killed in clashes with the army in October. That incident was the bloodiest in Egypt since its revolution in February. Christians are a very small minority in Egypt, although the Coptic Orthodox Church is the largest Christian church in the Middle East, according the Coptic Orthodox Church Centre in Stevenage, England. The U.S. State Department estimates that Egypt is roughly 9% Coptic Christian, but the Pew Forum on Religion & Public Life, which released a report on the global Christian population last year, says it is probably closer to 5%. Egypt did not release the number of Christians in its 2006 census, the think tank said. The leader of the Coptic Christian community since 1971, Shenouda was in poor health off and on for many years. He traveled to the United States to undergo medical tests last year. He died of renal failure "due to the diabetes he endured for years," said Sheif Doss, head of the Egyptian General Coptic Association. The pope had lung cancer, which spread to the rest of his body, Doss said. "The funeral is expected to take place in two days, as massive preparations must take place first. It is a historical event and 2 million people are expected to attend the prayers. I don't expect violence though," Doss said. Egypt's Supreme Council announced Sunday three days of mourning for the Coptic Christian community. Shenouda will be buried Tuesday at Emba Bishoy monastery in Wadi Natroun, northwest of Egypt's capital, said Markus Askuf, spokesman for the Coptic Church. The area is home to some of the world's earliest Christian monasteries. Shenouda, a journalist in his youth, was once sentenced to spend four years in Wadi Natroun by the late president Anwar Al-Sadat. In addition to millions of followers in Egypt, the Coptic church has adherents in Europe, Canada, the United States, Kenya, Zimbabwe, Namibia and South Africa. U.S. President Barack Obama and his wife offered their condolences Saturday after news of Shenouda's death spread, saying he will be remembered as "a man of deep faith, a leader of a great faith, and an advocate for unity and reconciliation." "His commitment to Egypt's national unity is also a testament to what can be accomplished when people of all religions and creeds work together," the Obamas said. When a Coptic pope dies, all 150 bishops of the church's Holy Council appoint an acting patriarch until a vote is conducted for a successor, Doss said. Thousands of bishops, priests and monks are eligible to vote.